I am nothing if not practical. I don't have anything on the boat that doesn't have at least two uses. The glass that goes into the door when we close up the boat also serves as the backsplash for the sink. My biggest cooking pot has a vented lid that serves as the colander for the boat. I dress in dull colors because they're interchangeable. Or did. I just bought a pair of pink saddle oxfords. Pink. Leather. And the saddle is a dark brown crocodile. They're quite handsome. Last year, I'd have never bought pink saddle oxfords. But my time is short(er). I mean, it is shorter because I'm a year older, but also, this illness has made me more acutely aware of my mortality. I bought a pink coat. 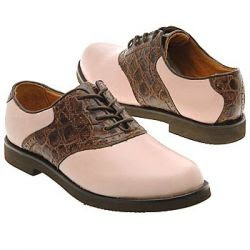 And when I saw the pink saddle oxfords, I just had no choice. I'd not had a coat that wasn't black or brown or gray or navy blue, I think never. Having a pink coat is liberating. I have a tan this summer. It looks good with pink blouses. (It's actually probably a function of the prednisone making me very sun-sensitive, despite using SPF-45 protection). I've dropped about ten pounds with the prednisone, due to improved heart function, which is HIGHLY unusual; most folks gain large amounts of weight while taking steroids. I have lots more energy, and I had an echocardiogram yesterday that the tech said showed the pericardial effusion shrinking, normal pulmonary artery pressures and no signs of right heart enlargement, which was indicated in January. Pink shoes are a good thing. I went to the cardiologist a few weeks ago for a 6 month checkup, and he said the fluid was back in my pericardium, not as much as before, but he thought that it was due to connective tissue disease causing chronic inflammation. He sent the results of his exam to my rheumatologist, who concurred with his thought that it's a (yet to be named) connective tissue disorder. The rheumy has decided that I should do a short course (6-8 weeks) of steroids to reduce the inflammation and fluids. The other item on that stead is that the steroids spike blood sugar, so for the next 6-8 weeks I'll also be doing insulin. The cool part about that is that when I went to see my endocrinologist (how many doctors do I have to buy boats for??) , he gave me an insulin pen with which you don't have to measure the dose... just turn a dial until your number comes up. It doesn't have to be refrigerated, and I don't have to measure blood sugar before and after meals... just shoot twice a day and it's long acting stuff. So the next week I went to the pulmonary clinic, which I have been doing monthly since my diagnosis in January. One of the things I do each time is walk for six minutes and see how far I can go. Often in the past, I have either had to walk with supplemental oxygen, or end the walk early because of oxygen desaturation. In May, I had to stop after two and a half minutes because my saturation had dropped below 80%. In July, however, I walked more than 460 meters in six minutes and my oxygen level, on room air, never dropped below 87%. Boys and girls, that is four and a half football fields. Last Christmas, my husband followed me through Target and said I stopped every fifteen paces to catch my breath. The insulin is still a little tricky, but my fasting glucose was 113 this morning, which is completely normal for me. This long-acting stuff is much gentler than your grandma's insulin.